That’s a date for your diaries at the very least, most likely a date for the history books too, as what might just be the most delayed anime movie in history finally has a release date set in blancmange, if not stone. Funimation Entertainment have revealed that Evangelion 3.33 You Can (Not) Redo will be released on DVD and Blu-ray on February 2nd 2016. This title has seen close to 2 years of delays, as the Japanese production committee chose not to sign off on Funimation’s first attempt to release it. Subsequently Studio Khara and director Hideaki Anno took a direct hand in ensuring the English language release, both dub and subtitle versions conformed to his vision. We’ll find out what that means in February, although you can expect the Manga Entertainment release to be a few months further down the line. And they still haven’t finished the 4th and final movie in Japan! A Live Action Tiger & Bunny Movie? At least that’s what Imagine Entertainment intend. They and Ron Howard are linked as producers of the project, although no director or stars have yet been named. It’s very much a pre-production situation at this point. But if any anime title is ripe for a Hollywood makeover, it’s Tiger & Bunny, the superhero/reality TV show crossover that took on the US entertainment industry at its own game and at least matched it. After all, Superhero movies are big business, and Tiger & Bunny does enough that is original with the genre to make it stand out. It’s also set in a very US based city, with a strong and diverse cast of characters, meaning very little would be lost in translation when it comes to adapting it. The thing is that it will be a superhero movie in a multiplex culture replete with superhero movies. Two reviews for you last week, beginning with Muv-Luv Alternative: Total Eclipse Part 2. I didn’t have high hopes for Part 2 following a thoroughly dispiriting watch of Part 1. It was a bloody, action packed giant robot versus relentless aliens show for the first two episodes, and then it forgot that completely for some multinational xenophobic test pilot shenanigans, coupled with the most unbelievable romance I have seen in recent anime. I didn’t think it could get worse in Part 2, but it did. It became a harem comedy, but then in its final arc it pulled out the awesome, bloody, action packed giant robot mayhem again, and it did it even better than in the opening episodes. It’s a hell of a chore, but Muv-Luv finished on just the right kind of memorable noet. Click on the review to read more. Then it was the turn of Magi: The Kingdom of Magic Part 1. 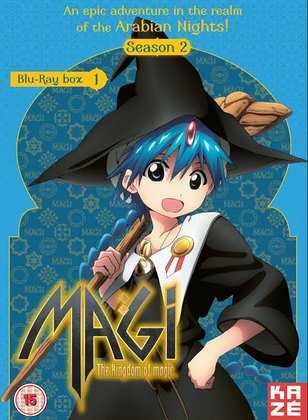 If you recall, last year saw the release of Magi: The Labyrinth of Magic, a shonen anime take on the Arabian Nights stories, which saw Aladdin, Alibaba, and a former slave girl named Morgiana teaming up to adventure in dungeons, gain magical powers, and help Sinbad battle a dark conspiracy in the world. The Kingdom of Magic picks up where Labyrinth left off, with the heroes going their separate ways on adventures of their own. And Aladdin goes all Harry Potter, as he travels to the Kingdom of Magic, Magnoshutatt, to enter the Academy and learn more about magic. 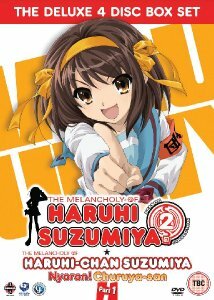 The Melancholy of Haruhi Suzumiya Season 2. You probably already knew that, given my lament about Endless Eight a couple of weeks ago, but I’ve finally finished the re-watch, and I have to admit that Season 2 just isn’t a patch on Season 1. The only good thing about it is the opening Bamboo Leaf Rhapsody episode, and the less said about Endless Eight the better. Let me put it this way, would you have watched 8 Groundhog Day movies telling the same story over again instead of just one? It’s nothing less than a massive troll on the part of KyoAni. The final five episodes had the chance to redeem it, but they failed too. The Sigh of Haruhi Suzumiya turned out to be the tale of how the SOS Brigade made the movie that was shown in Episode 0 of Season 1. It at least does something different for its five episode run, but it makes the mistake of showing how the magic was done, and it tries humanising Kyon and Haruhi. Prior to this, the show was a fantasy, a tale about a proto-god reshaping the universe so that things of interest to her would happen (including aliens, time-travellers, and espers), the gag being that she never realises, only her dogsbody Kyon. At least that’s one interpretation. The Sigh of Haruhi Suzumiya relegates the three supporting characters to little more than puppets, and focuses on the personalities of Kyon and Haruhi, and they both turn out to be pretty dislikeable as human beings. It makes me wish that Season 2 never happened. Fortunately true redemption was on the cards when it came to the Haruhi Suzumiya movie. I reviewed The Melancholy of Haruhi Suzumiya Season 2 a few years ago, and I was a lot more positive about it then. Season 1 of Haruhi Suzumiya is hard to find, but Season 2 of Haruhi Suzumiya is all over the place. Manga Entertainment released it on DVD, and all you have to do is wander over to a nearby e-tailer and place an order. 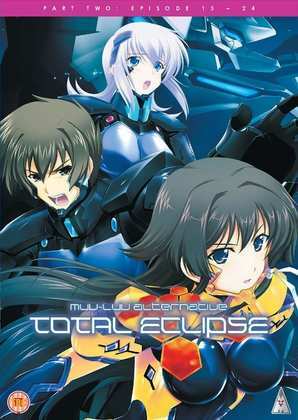 MVM will release Muv-Luv Alternative: Total Eclipse Part 2 on DVD and Blu-ray on the 19th of October. Kazé Entertainment released Magi: The Kingdom of Magic Part 1 on DVD and on Blu-ray last Monday.